Today is the release of David Craddock’s ebook “Stay Awhile and Listen.” This is the first volume of an extensively-documented oral history of the early days of Blizzard and Condor, which became Blizzard North. The book covers the earliest days of both studios as they toiled away on various console ports and moved towards their first big titles, Warcraft and Diablo, and continues up through the development and breakout success of Diablo I. The book is extensively researched, as the author conducted hundreds of interviews with former Blizzard employees including virtually everyone who worked on Diablo at Blizzard North. I read an advance copy of the book and interviewed him for the podcast earlier this week, and found the book interesting and informative, with lots of details even I did not know about the early days of Diablo’s development. Click through for the official press release, and check out our interview with the author in the Diablo 3 Podcast #118. 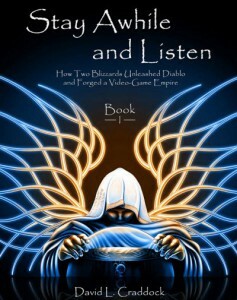 October 31, 2013 – Digital Monument Press is proud to announce the immediate availability of Stay Awhile and Listen: How Two Blizzards Unleashed Diablo and Forged a Video-Game Empire – Book I for Kindle and iBooks e-readers and apps, with a Nook version expected later this afternoon. The first volume in the series introduces readers to the teams responsible for creating the seminal entries in Blizzard’s bestselling WarCraft and Diablo series of PC games. Stay Awhile and Listen – Book I has garnered praise from critics and veteran game developers. “David Craddock’s Stay Awhile and Listen masterfully retells the tale of the game development Camelot created by the founders of Blizzard Entertainment,” said Richard Garriott, creator of the Ultima series of role-playing games. Written from hundreds of hours of interviews, the Stay Awhile and Listen series documents the meteoric rise of the two Blizzards and their influence on the video-game industry. 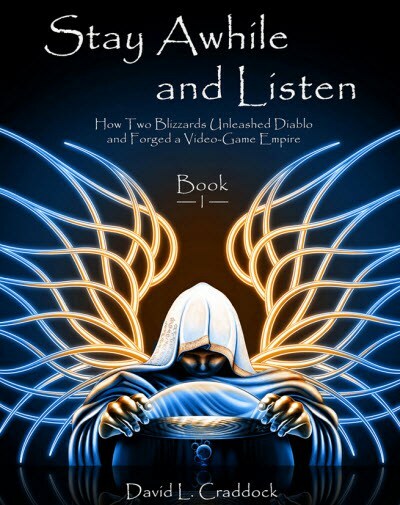 Stay Awhile and Listen: How Two Blizzards Unleashed Diablo and Forged a Video-Game Empire – Book I is available now on Kindle and iBooks e-readers and apps. The Nook version is expected to go live later today. Digital Monument Press publishes books that chronicle the making of video games, the personal accounts of the developers that make them, and the practices, culture, and trends that drive the game industry. Learn more about Digital Monument Press at dm-press.com, and follow Digital Monument Press at facebook.com/dmpressbooks and @DM_Press on Twitter. David L. Craddock lives with his wife and business partner, Amie Kline-Craddock, in Canton, Ohio. He writes short and long fiction, nonfiction, and grocery lists. His young adult fantasy novel, Heritage, will be published by Tyche Books in Summer 2014. Follow him at davidlcraddock.com, facebook.com/davidlcraddock, and @davidlcraddock on Twitter. Diablo 3 Transmog = Dressing Up Dolls? Is this only gonna be available as an eBook? I work in a big independent bookstore and i would love to sell this book in our gaming section. PS: the official link isn’t working. We have no firm plans to release STAY AWHILE AND LISTEN in print, although that is an option we’ll explore if we get enough interest. Thanks for the information. I will keep track of the development!